It’s time for the next recipe I tried that was part of Williams-Sonoma and their post about Oktoberfest recipes. Pork is a mainstay when it comes to Oktoberfest and German cooking, and this recipe is a very simple one that makes great use of three great pieces of this type of cooking – pork chops, cabbage and apples. This one is a pork chops with cider glaze recipe that you can prepare and have on the table in under 30 minutes. If you want to take the time to brine your pork chops ahead of time, you could do that overnight and have some really flavorful chops when you are done. I’ll post the brine recipe after this recipe. Season the pork chops generously with salt and pepper. In a large skillet over medium-high heat, warm the olive oil. Add the pork chops and cook, turning them once, until they are golden brown, about 5 minutes total. Transfer the chops to a plate. Add the cabbage to the skillet and cook, stirring frequently, until the cabbage is softened, about 3 to 4 minutes. Increase the heat of the skillet to high, pour the cider and vinegar over the cabbage, and boil until the liquid is reduced to about 1 cup, about 8 to 10 minutes. Stir in the thyme leaves. Return the pork chops to the skillet and any accumulated juices from the plate and spoon the glaze over the chops. Cover the skillet, reduce the heat to medium-low, and simmer until the pork chops are tender and barely pink inside, about 5 minutes. Arrange the cabbage and pork chops on a platter, top them with the glaze and serve immediately. I have to tell you that you really do need a large skillet for this if you are going to make a whole head of cabbage. I only used half of a cabbage and it more than filled the skillet I chose to use. I also added a couple of apples to the cabbage as it was cooking for even more apple flavor to the dish. I served this with just some plain white rice, but it would go well with some noodles or even some German potato salad. If you want to make some brine for these pork chops, here is a very quick brine recipe you can put together to give some great flavor. Combine all the brine ingredients in a large bowl and stir. Immerse the pork chops in the liquid, cover and refrigerate for at least 6 hours or preferably overnight. Brining really does make the meat more moist and adds great flavor, so if you have the time and are planning ahead, you might want to give it a try. 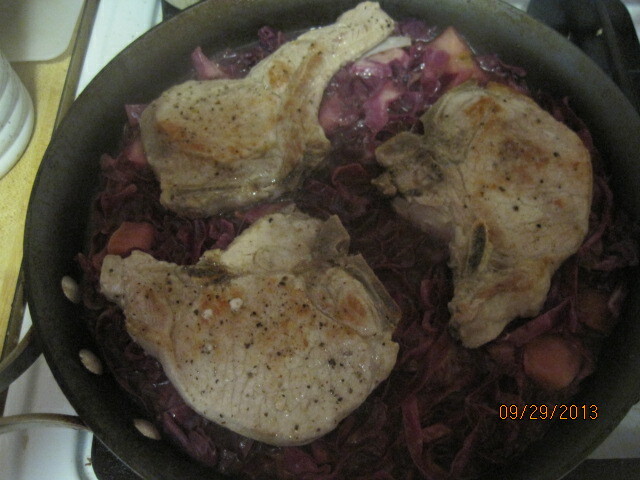 I loved the apple flavor that permeated the chops and the cabbage in this dish and it was very easy to make. That’s all I have for today. Check back again for more recipes I’ll be trying out. I do have some new choices for a roast beef, a roasted chicken and a whole bunch of other recipes I am planning to try. Until next time, enjoy the rest of your day and enjoy your meal!